I think that my version looks a bit more magical. My goal was to build a box where it is not immediately clear what closes the box. 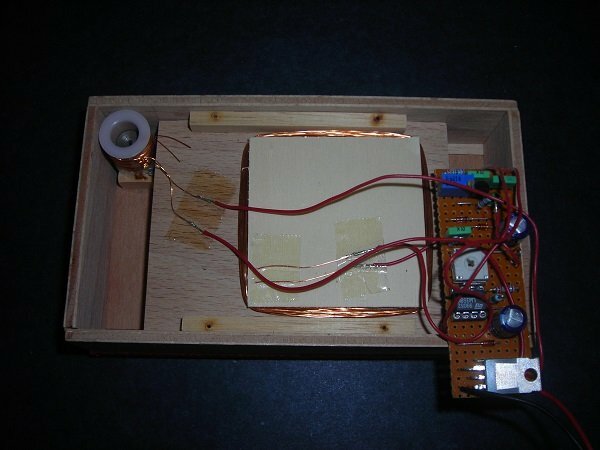 The electronics are hidden in the boards of the box. What I built is only a prototype some 20 years ago, so the walls of the box are way thicker than they have to be. There is no reason why this could not be made to fit into a 1/4" thick board today. 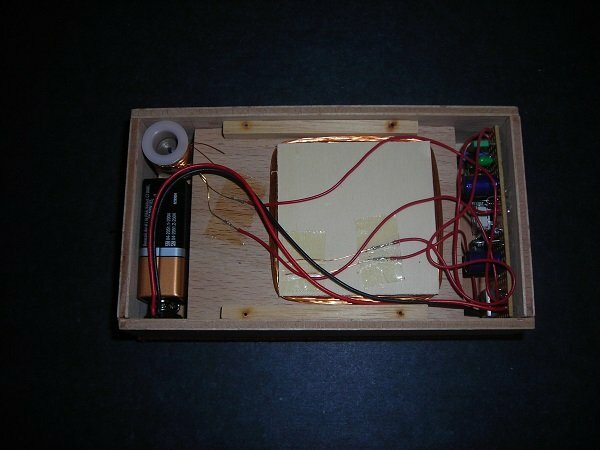 I am not using a motor as the actuator for the box as Anverdi used for his box. The electronics is all pre-microcontroller age. It appears that Joao Miranda has copied my idea of the more magical closure mechanism without credit for his haunted box. Theft is a common thing in magic. At least now you know who came up with it first more than 20 years prior to Miranda. Oh my was it fun to build electronics. The smell and smoke of solder and burned flux still lingers in my nose. Below a photo of the inside of the box. And here I show the guts of the electronics clearly visible. Everything neatly built on a little prototyping board. Hi, Read with great interest your development on the Anverdi box. Would you mind sharing the electronic workings? I built this 30 years ago. My notes are most likely lost. I might have the circuit diagram somewhere in a box deep in my basement, but it is not something I could search for easily. But as far as I can remember the electronics is for the most part the way Anverdi describes it. I still do have the box and it would be possible to reverse engineer the circuit directly from the board. But electronics has advanced and I think this could be built much better differently with a 50 cent microcontroller.